Pediatric cardiac tumors are rare and usually benign. An infectious etiology such as tuberculosis invading myocardium and presenting as infiltrative mass is extremely rare. We present a case of a 15-month-old girl with clinical feature of cardiac failure who had infiltrative multiple myocardial masses in echocardiogram. The index patient had 2 weeks history of generalized swelling of the body and reduced urine output; poor feeding and intermittent fever and cough of 1 month. She was irritable and tachypnic. She had tachycardia, periorbital puffiness, normal heart sounds, and no murmur. The chest auscultation revealed bilateral scattered crepitation. The liver was enlarged and tender. The hemoglobin was 9.6% g, total white blood cell count was 9600/cmm with neutrophil dominance (65%), and erythrocyte sedimentation rate was 36 mm after 1st h. The chest X-ray showed cardiothoracic ratio of 0.6, and patchy infiltration mainly involving the left upper zone and right lower zone with right-sided mild pleural effusion [Figure 1]. The Mantoux test and induced sputum cartridge basic nucleic acid amplification test for tuberculosis were negative. Echocardiogram showed infiltrative cardiac mass involving interventricular septum, extending superiorly toward right ventricular outflow without obstructing it. 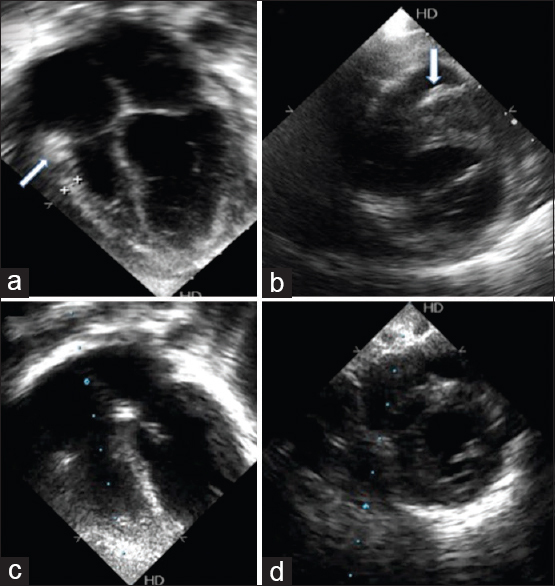 The free wall of right ventricle was bright and echogenic [Figure 2]a, [Figure 2]b and [Video 1]a, [Video 1]b. There were mild pericardial effusion and systemic venous congestion. Computed tomographic (CT) scan of the chest showed focal consolidation of bilateral lower lobe with mild pleural effusion. A close look of the contrast-enhanced CT scan showed radiolucent mass in the interventricular septum extending superiorly [Figure 3]a,[Figure 3]b,[Figure 3]c and [Video 2]. The initial diagnostic impression was in favor of malignant cardiac tumor involving the myocardium. The patient was started on antifailure medication, and cardiac magnetic resonance imaging (CMR) was done to delineate cardiac tissue differentiation. It showed heterogeneous enhancing lesion involving anteroseptal and anterior walls of the left ventricle and encasing the right ventricular outflow tract and pulmonary trunk and extending toward the thymus. The pericardium shows soft-tissue intensity enhancing lesion involving anterior and lateral walls. Nodular lesions in the upper lobe of the left lung also seen. The differential diagnosis from CMR was lymphoma and pulmonary tuberculosis extending to the myocardium [Figure 4]a,[Figure 4]b,[Figure 4]c and [Video 3]. In view of clinical suspicion of tuberculosis, antitubercular drugs were started empirically with category-1 regimen consisting of 2 months of isoniazid, rifampicin, pyrazinamide, and ethambutol followed by 4 months of isoniazid and rifampicin. Over next 2 weeks period, the child started showing signs of improvement; there was general well-being, and edema disappeared. After 1-month, weight gain started and there were no constitutional symptoms. Echocardiogram done after 2 months revealed complete disappearance of cardiac mass [Figure 2]c, [Figure 2]d and [Video 1]c, [Video 1]d. The pericardial effusion subsided, and the ventricular function was normal. A retrospective diagnosis of myocardial tuberculosis was made on the basis of clinical history, imaging, and clinical response to antitubercular therapy. Extrapulmonary tuberculosis accounts for 15%–20% of mycobacterial infections. Involvement of the heart is described in <0.5% of a large autopsy series of 14,000 analyzing death due to tuberculosis. Usually, pericardium is affected in cardiac tuberculosis. Myocardial involvement is rare, only 0.3% of the patients dying from cardiac tuberculosis found to have myocardial involvement., Three distinct forms of myocardial tuberculosis are recognized: Diffuse infiltrating, miliary, and nodular. The modes of spread to the myocardium include through lymphatics from mediastinal nodes, directly from the pericardium or through a hematogenous route. Clinically, myocardial tuberculosis can present with features of congestive cardiac failure, rhythm disturbances, left ventricular pseudoaneurysm, and features of the superior vena cava or right ventricular outflow tract obstruction. High index of suspicion is required to diagnose myocardial tuberculosis. Histopathological diagnosis may not be possible and feasible. The treatment of myocardial tuberculosis primarily involves antitubercular therapy, and complete clinical and radiological resolution has been well reported in the literature. Resolution with antitubercular treatment can be demonstrated by serial echocardiography. Tuberculosis can be considered in the differential diagnosis of myocardial mass in areas having a high prevalence of tuberculosis. 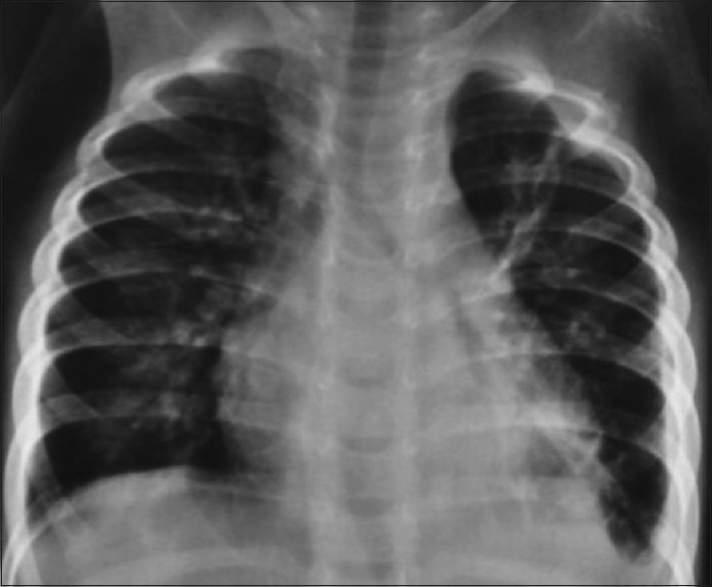 Kannangara DW, Salem FA, Rao BS, Thadepalli H. Cardiac tuberculosis: TB of the endocardium. Am J Med Sci 1984;287:45-7. Custer EN, Charr R. Tuberculosis of the myocardium. JAMA 1939;112:1333-4. Gaultier Y, Alou A, Cénac A, Develoux M, Vetter JM. Tuberculoma of the heart. Contribution of echography. Apropos of a case. Arch Mal Coeur Vaiss 1987;80:1413-6. Jagia P, Gulati GS, Sharma S, Goyal NK, Gaikwad S, Saxena A. MRI features of tuberculoma of the right atrial myocardium. Pediatr Radiol 2004;34:904-7. Gulati G, Sharma S, Kothari SS, Juneja R, Saxena A, Talwar KK. Comparison of echo and MRI in the imaging evaluation of intracardiac masses. Cardiovasc Intervent Radiol 2004;27:459-69. O'Neill PG, Rokey R, Greenberg S, Pacifico A. Resolution of ventricular tachycardia and endocardial tuberculoma following antituberculosis therapy. Chest 1991;100:1467-9.